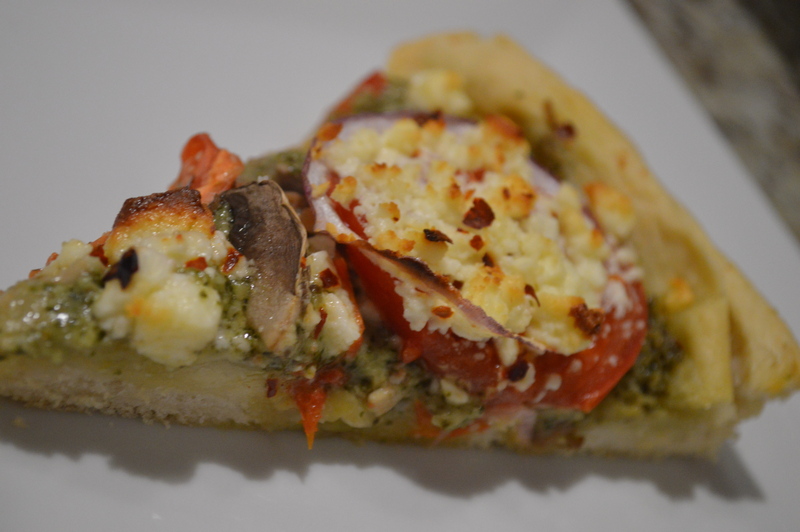 Cleaning Out the Freezer: Pesto Pizza and Homemade Chicago Style Crust | Bloom. Weekends are great for pizza. Adam and I used to order pizza often, but last summer I canned some pizza sauce and we began making pizza more and more often. We love to make pizza at home so much that if we were to ever able to design the patio of our dreams it would include a large stone pizza oven. But, it doesn’t stop us from making pizza at home. There are plenty of mixes for pizza crust, but it’s so easy to make from scratch. Not to mention, worlds cheaper. In a small bowl, mix together water, yeast and sugar. Let sit for about 5 minutes or until it gets foamy. Mix flour and salt in a large bowl or using a stand mixer with a dough hook. Add yeast mixture and oil. Mix until dough is smooth. Should take about five minutes. Add a tablespoon of olive oil to a large bowl. Transfer the dough to the bowl and turn it to coat in the oil. Cover with either saran wrap or a slightly damp towel. Let the dough rise until it has doubled in size, about 25 minutes. 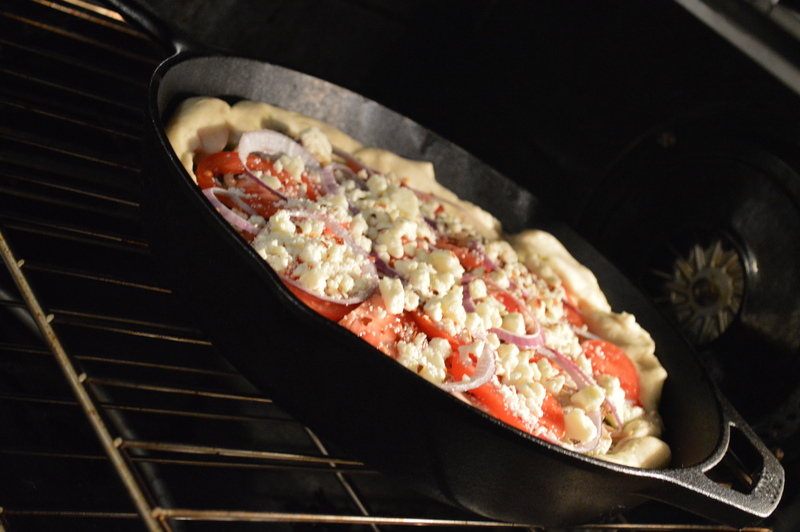 Add pizza toppings and bake at 400 degrees for about 25 minutes. Cast iron is honestly the best. Instead of sauce on this weekend’s pizza, I busted out some frozen pesto I had made last August when the basil plant was booming. The pesto recipe is here. It’s so good and I love the smell of it thanks to the strong, fragrant basil. I used about a cup to cover the crust. Other toppings included some shredded chicken from the birds that we raised last fall that was cooked a few days earlier, mushrooms, red onions, some crushed red pepper and feta cheese. Random stuff, yes. But, I was just trying to get some stuff out of the fridge. The pizza was perfect for a relaxing weekend night. The dough had a great texture and taste. 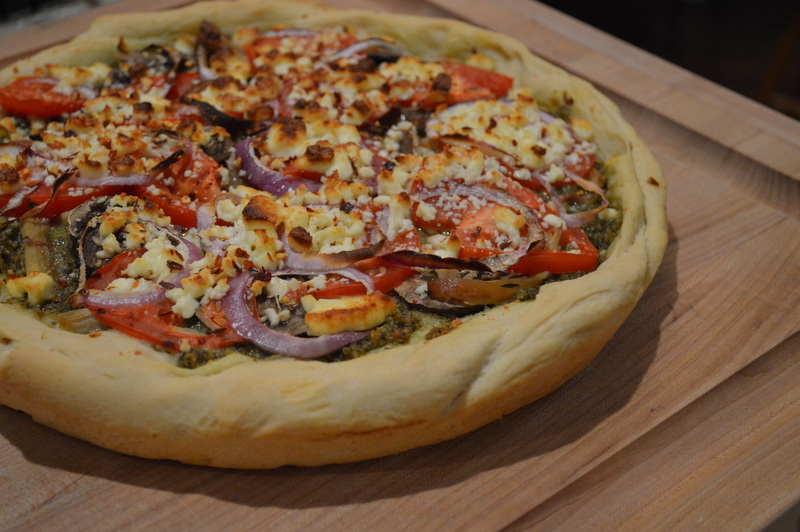 But, if you are not cleaning the refrigerator out like me, sliced tomato and fresh mozzarella are also excellent toppings for a pesto pizza. Pingback: Cleaning Out the Freezer: Sweet Corn Tart | Bloom.